What a feeling and what an honour! A night of emotion, pride, family and old friends at the Red Robinson Theater in Vancouver. 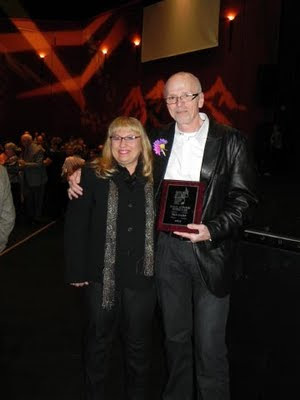 I am now officially a member of the BC Country Music Association Hall of Fame. And I got to be a part of the show. The producer was Angela Harris, singer, songwriter and member of the High Bar Gang. 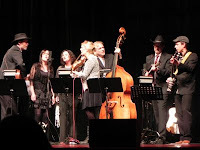 Angela called to explain their concept was in many ways like the Grand Ole Opry in Nashville, a live radio show staged with music from many different performers. But they needed a radio guy to do the intro and extro. They thought, "Ted's a radio guy, maybe he'd like to do it." You can guess what my answer was. So I intro'd the show, introduced the High Bar Gang, was inducted last, 10th out of 10 and then extro'd the show and said good night. Let me tell you about the band. The High Bar Gang not only entertained and backed up other artists, but also acted as hosts for the evening. They are a bluegrass band. As their website says "classic bluegrass for modern times". And are they good! In addition to Angela, members include Barney Bentall, Shari Ulrich, Wendy Bird, Colin Nairne, Eric Reed and Rob Becker. Barney describes them as four rockers, a hippie and two roots singers. If you go to their website you can hear what they sound like and see their schedule of appearances. It was done by old friend Claude Lelievre, the man responsible for the Merritt Mountain Music Festival. 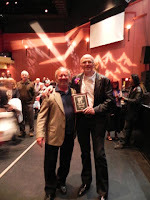 I was Vice President of the BCCMA when he was President back in the 80's. We played old-timers hockey together. He had many kind words. Thanks Claude! What made the night even more special was the number of other inductees who were also on the "old friends" list, Jess Lee, Kenny Shaw, Cheryl Homan, Larry Wayne Clark and Dee Lippingwell. Wonderful to see Ron and Sue Irving, Gary Taylor, Elmer and Alice Tippe, Rick Tippe, Ray Ramsay, Bob Saye and many more. British Columbia is rich with talented people who are dedicated and unafraid to share what they know. The BCCMA has truly become a community and country music in Canada is all the better for it. Songwriter, coach and mentor Ralph Murphy of ASCAP Nashville told me some time ago that Canadian music had always had the talented singers and musicians, what was missing was consistently great songwriting. Not just a once in a while thing, but over and over, hit after hit. Canadians and British Columbians have written big national and international songs and that's no accident. To create more and improve the craft, songwriters need an atmosphere of support, nurturing, mentoring and collaboration. They also need the contacts in the music industry to be heard. That's what we tried to do more than 20 years ago with the BC Country Music Association, create a community for songwriters and musicians. Judging by the many success stories, we did a pretty darn good job. 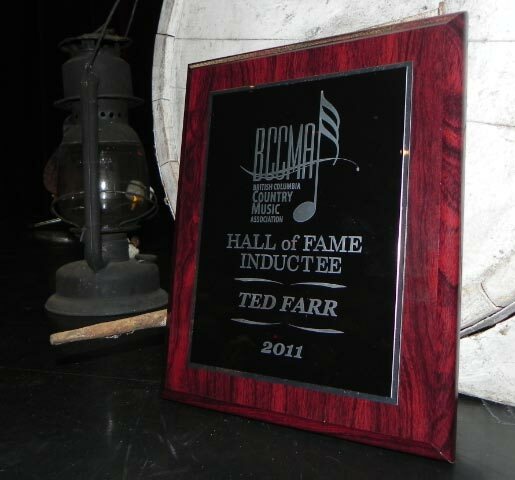 I am proud to be one of the 2011 inductees into the BCCMA Hall of Fame and proud to have played a small role in BC country music. Thank you, and my wife Terrie thanks you too. We had a great time!